The Romans left Britain in about 410 AD and other than leaving roads, walled cities and large houses behind their culture did not affect the Brittonic people left behind. With on big exception: The Roman policy of divide and rule, pitting clan against clan, led to important changes. No longer was the divide in the north of Britain down to being part of the Brigantes, the divide was down to Roman divisions: The people of Elmet, ruled from their Capital Loidis (now Leeds) contained the Huddersfield area and were the people who took the side of Rome in the tribal wars. 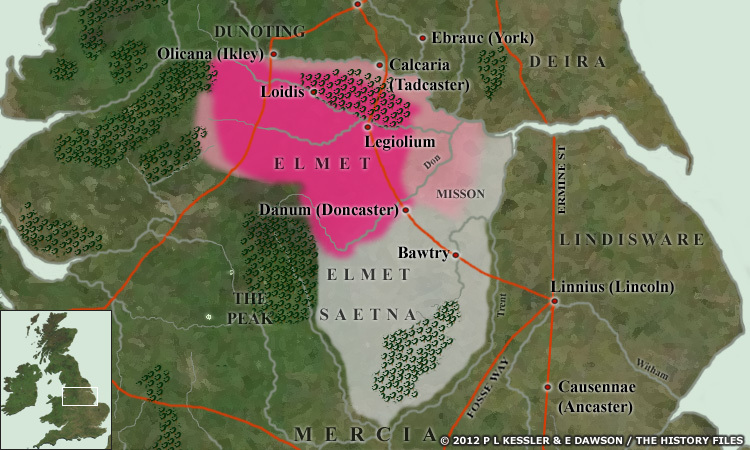 Siding with the invaders put the Nation of Elmet at odds with the surrounding tribes, meaning it developed separately. The name Elmet still exists in the names of towns to the east of Leeds, such as Sherburn in Elmet and Barwick in Elmet. Elmet was part of a confederation of nations called in the native Cumbraic (a form of Old Welsh) Yr Hen Ogledd, or the Old North. The other parts of the Old North were Reged, on norther Cumbria and Galloway, Gododdin in Lothian and the Scottish borders, and Ystrad Clud or Strathclyde. The boundaries of Elmet were the River Wharfe valley to the north, the River Trent to the east and south. The eastern boundary was The Peak for the southern part and the Pennine watershed for the rest. There area was distinct from, but had close links to the Welsh. Stories about the Kings and Heroes of Elmet still exist in the poems and songs of the north Welsh, though little remains in the area itself. If you were born and brought in the area formerly known as Elmet, it is likely that what you have been taught in schools about the time of the Angles and Saxons is wrong for this area. The Saxons pushed the boundaries back, the grey areas in the map above marked Elmet Saetna, or Saxon Elmet, corresponding to what is now East Derbyshire and Nottinghamshire. The rest of Elmet, approximately modern South Yorkshire and West Yorkshire, dark pink on the map, were still independent and self governing. Pale pink areas were either high moors or swamp which were either not claimed as part of a kingdom, or remain unknown. The old Cumbraic ballads show that the Saxons were an aggressive people, attacking without warning or cause. Conversely what we have of Saxon history says the same about the inhabitants of Elmet. Hmm. The Saxons did eventually take the whole of Elmet, but it was too late to influence the culture as it was not long before the next wave of invaders appeared, the Vikings. Neither Anglo Saxon nor Viking really ruled, battles were on and off until 1066 when Harold beat Harald at Stamford Bridge, only to be beaten himself by the Normans later that year at Hastings. Fast forward to the last of the Norman kings, Stephen, who gave permission for the rebuilding of the derelict fort on Castle Hill above Huddersfield.